The Hiram M. Chittenden Locks connect Lake Washington to Puget Sound. 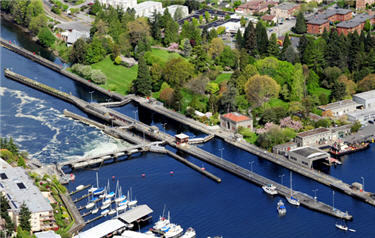 Also known as the Ballard Locks, the entire complex includes gardens, lawns, real operating boat locks, and a terrific indoor viewing fish ladder. This is a great place to stroll around, wave to the boaters, bring a picnic, and listen to free concerts in the summer. There are two ways to get here, either on the Ballard side or the Magnolia side. You'll probably find the Magnolia side a little easier for parking, but there is more stuff to do on the Ballard side. Grounds: 7 a.m. to 9 p.m. Fish Ladder Viewing Room Hours: 7 a.m. to 8:45 p.m.